Michel De Trez was born in 1965. He has had an interest in WWII history since his early years. As a child, he starts to collect some objects in the family home left in Belgium by American soldiers. Among these, a canteen on which a name and a serial number can be seen: “Guth”. Quite naturally, when he plays war games with the other children of his age, Michel is called Guth. But, who was this soldier? What could have been the motivation for these young Americans who had deliberately left their country, their family, all that they had or liked, to risk losing everything to liberate us from the Nazi regime? Was he still alive? These are questions he often raise, but at the time there was no Internet and it was not easy to find someone living in another country. At the age of 17, managing only a few words of English, he undertakes his very first trip, alone, to the United States with the idea of meeting American veterans to gather their war recollections. And who knows, maybe tracking down Mister Guth. His interest revolves around the History of the American paratroopers with a specific interest in the WWII pictures depicting paratroopers taken by war photographers. For months on end, he searches through the records of the National Archives of Washington, listing and collecting pictures, classifying them by campaign, unit and attends veterans’ numerous reunions to identify, as much as possible, the men on these photos and the location where they were taken. A meticulous work of investigation is carried out and thanks to this passion he can then build up unique archives… maybe the world’s largest on the subject. Following a meeting with Cornell Capa, the young brother of the famous photographer and war reporter Robert Capa, he’s invited to the international Center of Photography of the 5th avenue of New York and granted access to the prestigious collection of photos shot by Robert Capa for Life Magazine. Nine years passed, and what about Guth you may think? Still no trace of him. Michel has collected, identified and classified thousands of photographs never released before that he would like to share with as many people as possible. To do this, he plans on publishing through a series of books covering the campaigns carried out by American paratroopers in Europe. To complete this project his own way, he founds the publishing company D-Day Publishing. Whilst writing his first book in 1992, he comes across a photograph published in a book : “Band of Brothers.” A caption identifies an American soldier on a photograph: Forrest Guth. Guth… could it be the owner of the canteen? In the book, we learn that Guth is of German origin and like many German immigrants, he resided with his family in a region of Pennsylvania before the war. A great friendship develops between the young man and the veteran, a friendship that will lead to the writing of Forrest’s biography. The unit in which Forrest fought across Europe was the 101st Airborne Division, undoubtedly the most famous unit of the United States Army. It is said unit that is going to become the one Michel De Trez is going to specialize in. The two men regularly see each other, traveling together in Europe and to the United States. 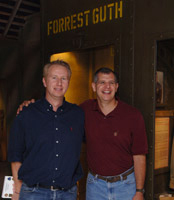 Forrest presents his brothers-in-arms and helps Michel to collect stories, photographs, testimonials and objects. The collected objects become one of the ways to illustrate his publications. It is no longer just a random canteen, helmet or jacket, they are unique objects that have a story to tell. And this is the story he wants to share. Michel de Trez and Col. Rob Dalessandro, U.S. Army Ret, Former Director US Army’s Heritage. 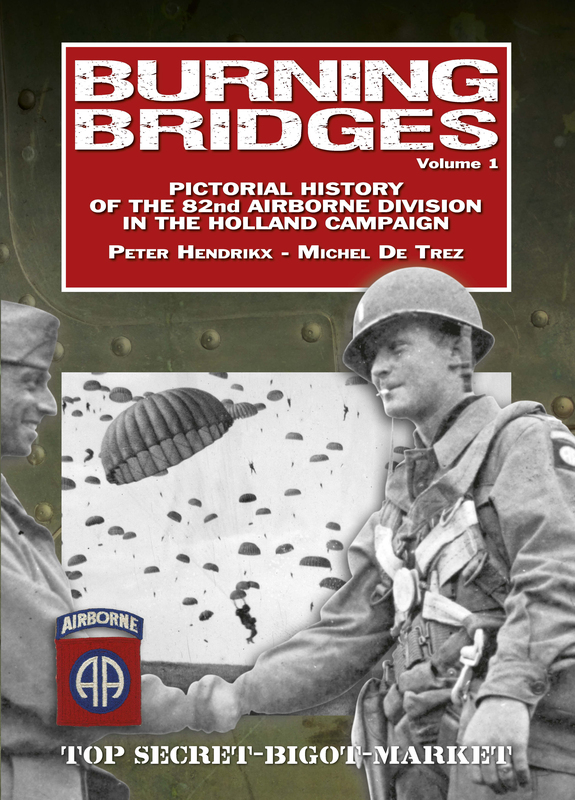 He then publishes numerous publications based on the paratroopers who very often are considered an authority on the subject. He contributes to many magazines. In the United States, at the opening of the Military History Institute, the US Army Heritage and Education Center, he is amongst many historians the only European author to be invited to present his publications. His reputation will also earn him the Medal of Excellence from the Embassy of the United States of America for his contribution to the preservation and transmission of the History of the United States; award him a citizen of honor in Kentucky for writing the biography of a medic paratrooper (Doc McIlvoy) and for having worked with the American director Steven Spielberg on several occasion. Two of his publications are part of the personal literature of the most famous film-director. This is when he produces the movie “Saving Private Ryan” and the television series “Band of Brothers” that his team calls upon the experimented author for technical advice and supply of suits and military gear. Strangely enough, it is the history of Forrest Guth’s company that Spielberg relates. Throughout many encounters with veterans, the author always kept in mind the idea of opening a museum where the American airborne fought and he built up an impressive collection of objects belonging to the veterans he met and who believed in his passionate projects. These latter willingly offered their invaluable keepsakes away to be later preserved and exhibited at the very spot they fought and he therefore holds what he believes is the largest worldwide collection of military objects on the subject. ”It is essential to pass on all this History and after publishing, there is no better option than exhibiting”, thinks the author. 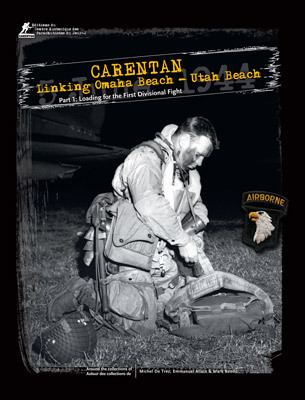 In 1994, during the 50th anniversary of D-Day, he travels to Carentan, first big city liberated by 101st Airborne, an exhibition lasting for four months. Visitors are impressed by the historic wealth of the exhibits. The local administrative body would like this collection made of historical heritage linked to the landings in the area to stay on the territory. But, where to find the funds to build a museum. No public funds appear to be available to permanently exhibit these private collections. But a question remains. How to seek funding and build a museum? No public sourcing seems readily available to exhibit these private collections on a permanent basis. In 2004, during the 60th anniversary of D-Day, the author successfully collects a budget of 100,000 euros thanks to the sales of his publications which he dedicates entirely to an exhibition called “The Greatest Generation” taking place in Sainte-Mère-Eglise. The author presents his latest publication: Sainte-Mère-Eglise – Photographs of D-Day. Big scaled display cases are put in place under a roof top of 1000m square. Forrest is here and for the first time, he discovers a mannequin which looks like him, presented in a similar way to Tussaud and Grévin museums. The mannequin wears his uniform and D-Day gear. Later on, in his pursuit of finding out the story of objects and photographs, he finds himself on the landing beaches of Normandy, accompanied by another specialist on the subject, Emmanuel Allain. His eyes cross a placard reading “For sale” on a house which he knows the historical past: the villa baptized by the Americans “Dead Man’s Corner”. This upper class villa in Saint-Côme-du-Mont, they know it well. She is in close-up on page 139 of their bedside book: “Rendez-vous with Destiny”. This book written in 1948 is the official story of the 101st Airborne. “. 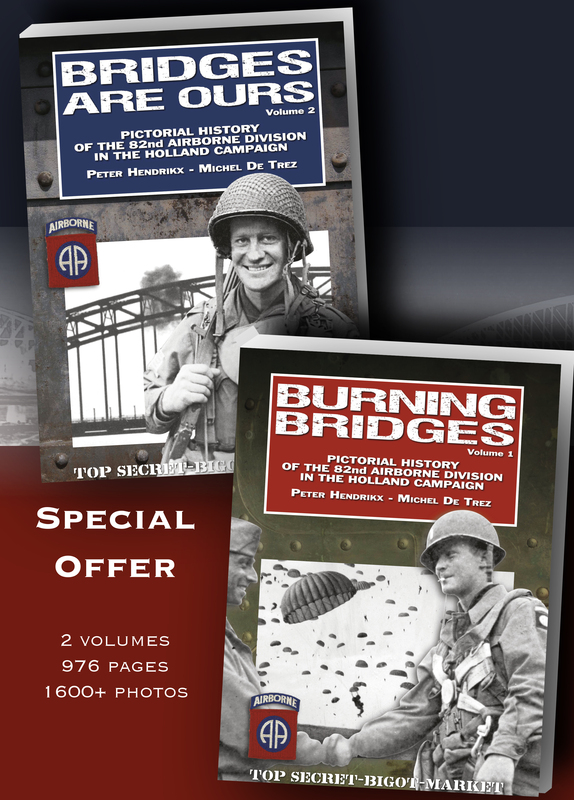 This book written in 1948 is the official story of the 101st Airborne Division. Right away, Michel knows that he doesn’t bump into this villa by chance. This will be the future Museum that he had dreamed of for decades. 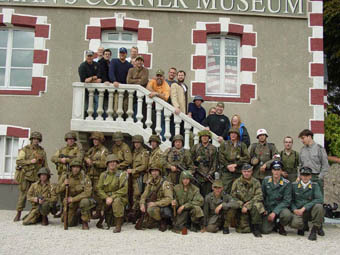 In June, 2005 twenty-six American veterans and a German veteran inaugurated the Dead Man’s Corner Museum which he has just opened with his new partner E. Allain. The place changes over the years and becomes the D-Day Paratroopers Historical Center. A museum, a historical route on the battlefield of Carentan. The museum says: it is the quality and story of exhibits that matters rather than the quantity. Easy for someone who has spent part of his life collecting these items with their story directly from the veterans of what will be called the biggest event of the 20th century. Cast of Brothers in Arms produce for History Channel, in front of Dead Man’s Corner Museum. 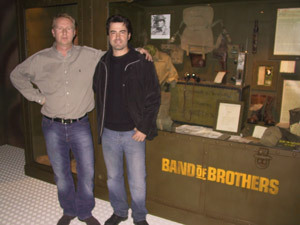 Ron Livingston, portraying Nixon in the HBO miniseries Band of Brothers, with the author. the history of the 101st Brothers in Arms. A partnership between the giant and the small museum is established and the museum collaborates closely with Colonel John Antal in the production of a documentary for History Channel, narrated by the American actor Ron Livingston. The small museum shakes up the habits. This new and unprecedented museum approach fascinates, and touches more particularly Mathieu Steffens, a young Belgian collector of barely 24 years, who founded a museum in Baugnez on the site of the notorious Massacre of Malmédy. Both men have the same vision of what a war history museum should be like today. In 2012, through the enthusiasm of his young years, Mathieu leads Michel into the taking over of the Museum of La Gleize. This one founded by Philippe Gillain, Gérard Grégoire, the Municipality of Stoumont – La Gleize and the Province of Liège is going to close its doors. Through nine months of works, a surface doubled in size, a new museography, collections enriched due to arrive on June 20th, 2013 at an opening ceremony in the presence of an American veteran of the fighting of the Gleize and the daughter of the founder of the Museum, Marie Gillain. Strangely, it is Steven Spielberg who had given to the talented Belgian actress her first desires for cinema. Nine months of works, a doubled surface, a new museography, and collections enriched to arrive on June 20th, 2013 at an opening ceremony in the presence of an American veteran of the fights of Gleize and girl of the founder of the Museum, Marie Gillain. Strangely enough, the talented Belgian actress first desires for cinema came from Steven Spielberg. The actors of Band of Brothers and the author. 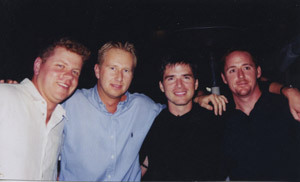 Michael Cudlitz (Bull Randleman), Michel De Trez, Matthew Settle (Capt. Ronald Speirs) et Scott Grimes (Don Malarkey). A somehow ambitious project to lead the public safely in a thrill simulation. Technological prowess to simulate the sensations of a flight, more than thirty times a day 7 days a week, with a real aircraft whose resistance is not designed at all for a lift on a single point. If we want to put ourselves in the shoes of a paratrooper of June, 6, it must be perfect. If we want to honor what these men have been willing to do for us, there is no room for amateurism. The companions surround themselves with the best people in the field, those who conceive high thrills attractions for the largest amusement parks of the world. This has required more than a year of study, feasibility test… Is it really achievable or is it just a dream? Is it possible to lift these tons of steel, aluminum and passengers more than 10,000 times a year without damaging its frame? On June 6th, 2015, commemorations take place to mark the anniversary of D-Day. Crowds are flocking to Saint-Côme-du-Mont. A gigantic building in the shape of a hangar is built where Dead Man’s corner is housed, just behind the small museum. He believes that two ingenuous people are going to fly the public there and that 6.000.000 euros of private funds are required for this small whim. The daughters of the pilots of June 6th, 44 ‘Stoy Hora’ plane came quite specifically from the United States to cut the ribbon which prevented the numerous guests from seeing what’s inside. The visitors enter a pre-show, receive a 3D briefing from an American Colonel and then push a door. There it is… ”Stoy Hora’. 71 years later, she is ready to fulfill her D-Day mission again. The honor given to both pilots, Colonel Frank Krebs and Major Howard Cannon is invaluable. The emotions felt by the daughters are unique. Innovation and technology are everywhere, it’s even one of the participant of the June 44 landings who tells the visitor his story all along the new museum: Colonel Wolverton, a paratrooper with a tragic fate at Saint-Côme-du-Mont.